AD // This is a paid partnership in collaboration with Marks and Spencer. All words, thoughts and images are my own. Well here we are. The month that lots of people love to hate is at an end and after many long, dark days the promise of spring is hopefully right around the corner. I don’t tend to mind January too much though, it’s my birthday month and also the birthday month of many of my closest friends and as it turns out, so many people I follow on social media too! There must be something about all of us Aquarians and Capricornians naturally gravitating towards each other on some ‘other’ level. There really is no better way to surprise a loved one or even treat yourself than with a beautiful bunch of blooms. 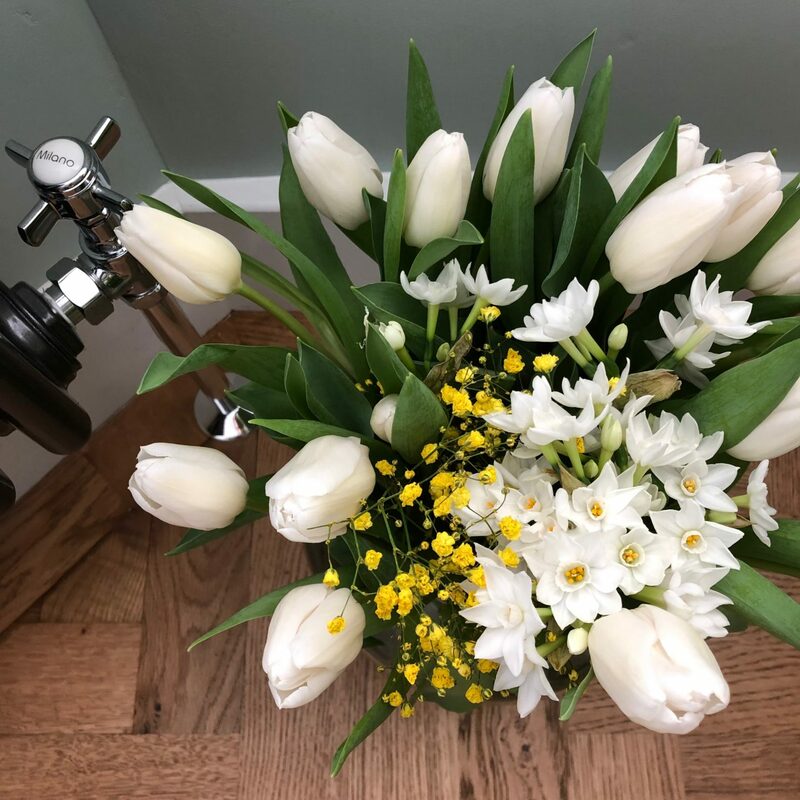 Remember, it doesn’t even need to be a special occasion, just reaching out to say thank you or letting someone know you’re thinking of them is also the most wonderful reason to turn to horticulture. 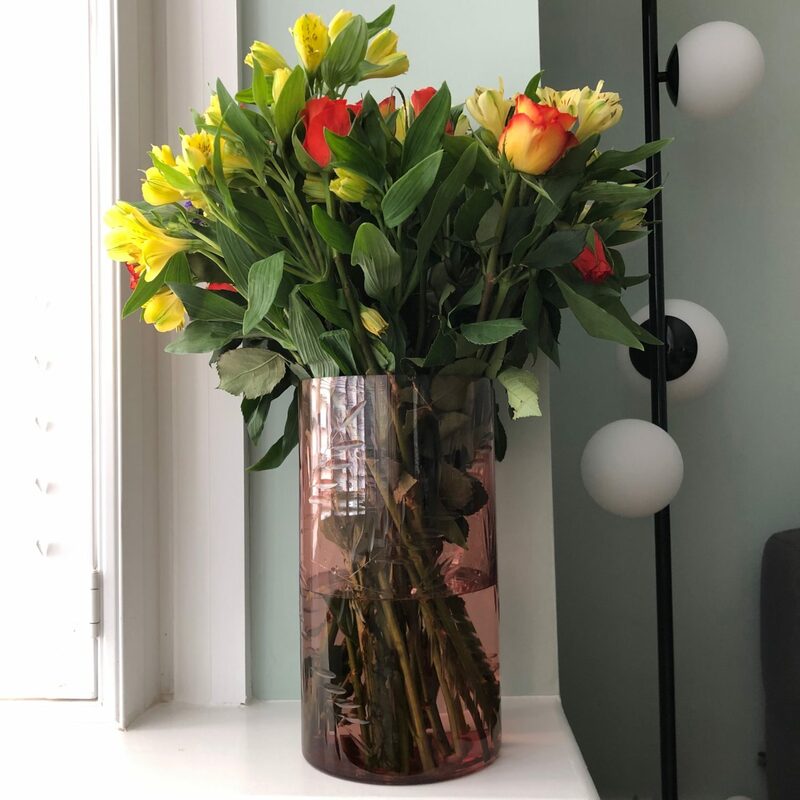 We’re lucky to have a really great M&S just down the road in Bromley and when I treat myself they’re always my go-to for the varied range, value for money and longevity – I bought some Alstroemeria last year that lasted well over two weeks! 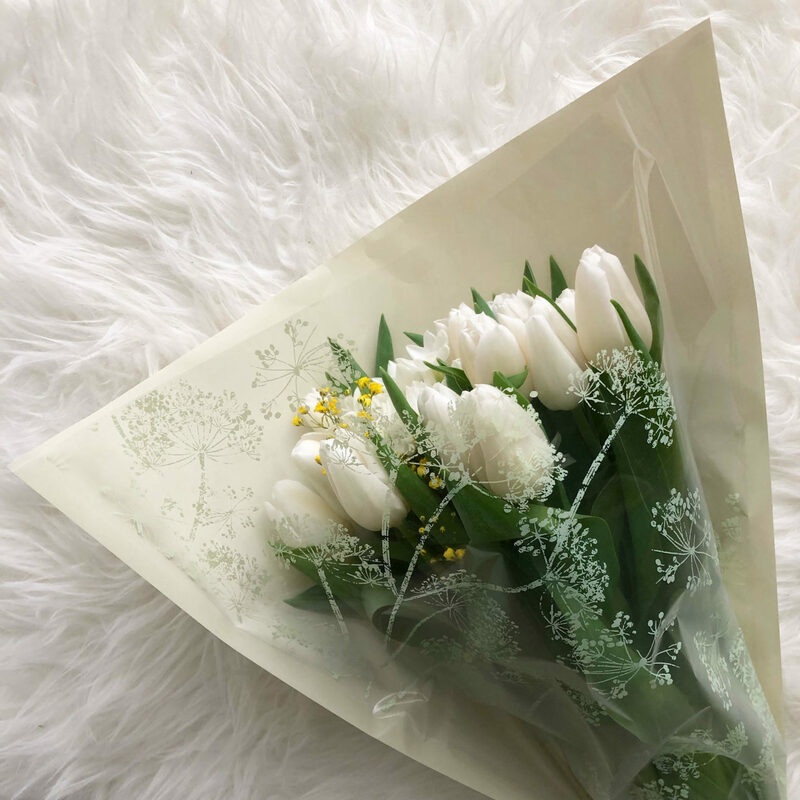 But you don’t even need to worry if you don’t have access to a store – all the Marks and Spencer flowers can be ordered online with free next day UK flower delivery. My little cat Boo approves of the delivery boxes! But never mind thinking about other people, I also love to gift flowers to myself (who doesn’t?) 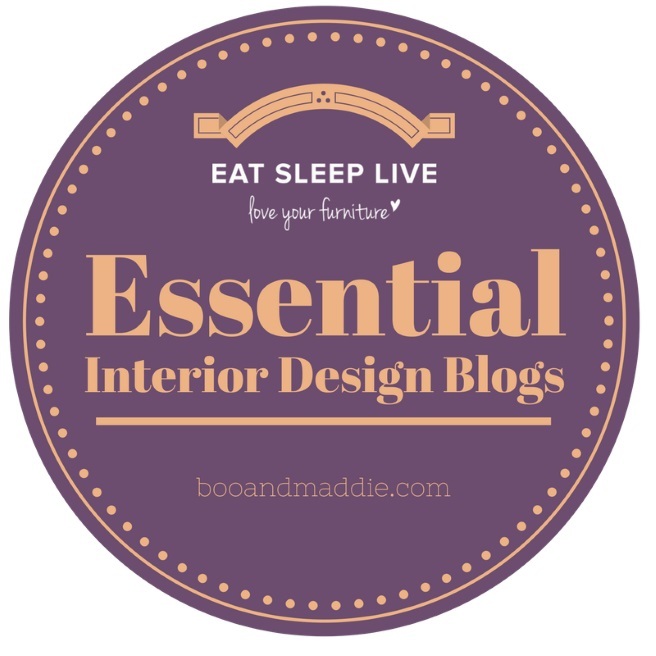 As I’m sure most of you know reading this, our home is in a constant state of never-ending renovation and DIY flux. 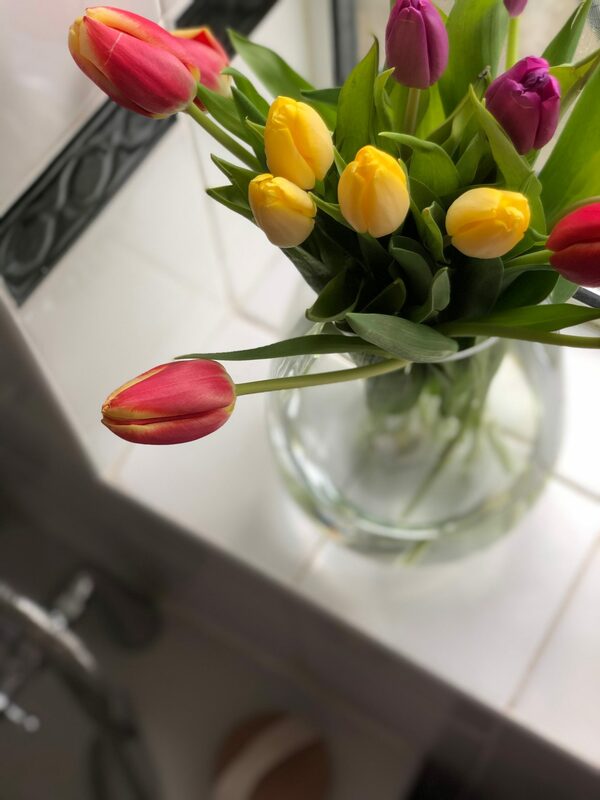 It often looks bare and not overly homely, so bouquets are a way I can inject a little bit of warmth into the space without too much effort. 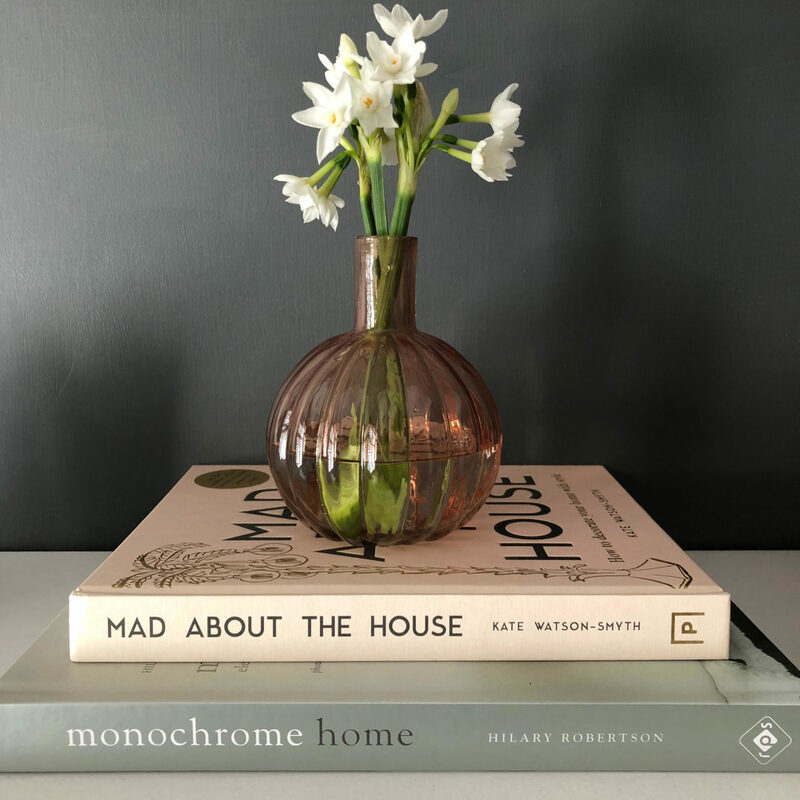 For me with many plates spinning at the same time, I love the floral arrangements from Marks and Spencer which I can literally unwrap and decant straight into a vase without needing to spend ages faffing and re-arranging. 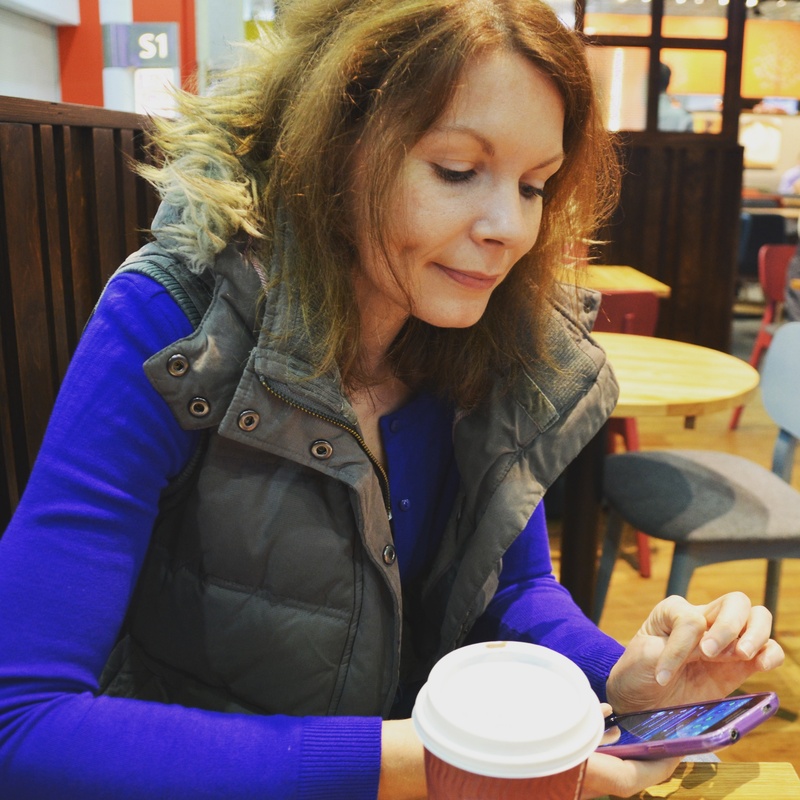 The perfect solution for a busy creative entrepreneur (yes, I’m still trying to work out my official ‘job title’ in this new venture of mine). One of my favourite places to pop flowers in our home is in the hallway. I’ve long since thought the hallway is an overlooked and underused room. I feel very fortunate that we have a typical 1930’s space which is light and airy. 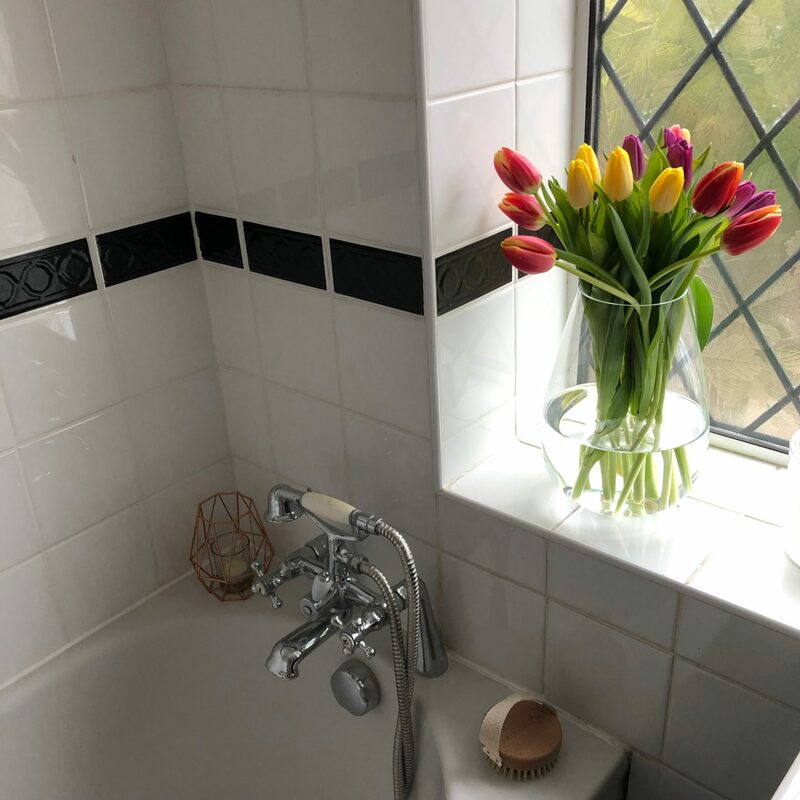 It’s more or less the only area of your home that most people see (think postmen, delivery men etc) and also the first impression for guests, so why wouldn’t you want to make it feel welcoming? 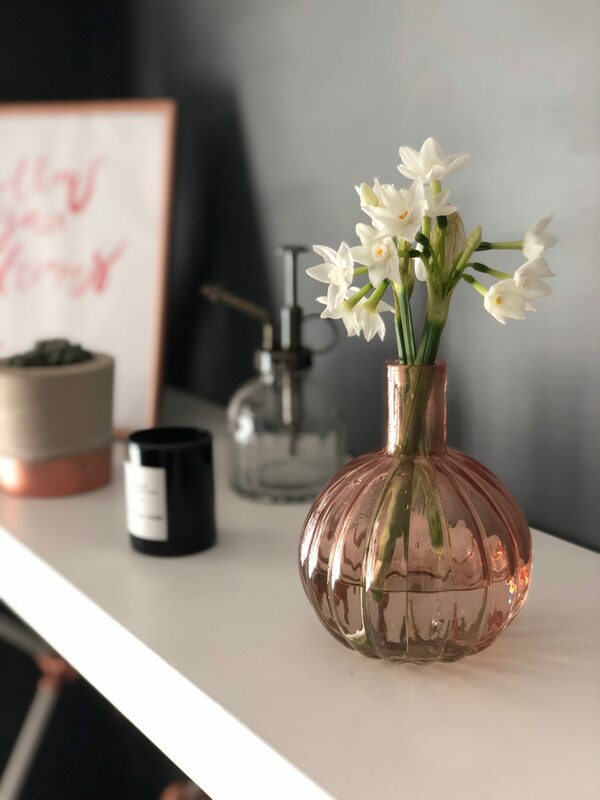 We have a reclaimed handmade oak console table in the hallway that is the perfect surface to add a vase or arrangement and as I’m not one for constantly changing up my interior décor, flowers are a way to do just that. Now I’m spending more time in our home office, it’s also a treat to have something in there which reminds me of the outdoors. This is our box room bedroom that we turned into a his ‘n’ hers office, again quite typical of 1930’s homes, but it’s perfect for the little bud vase I mentioned earlier. 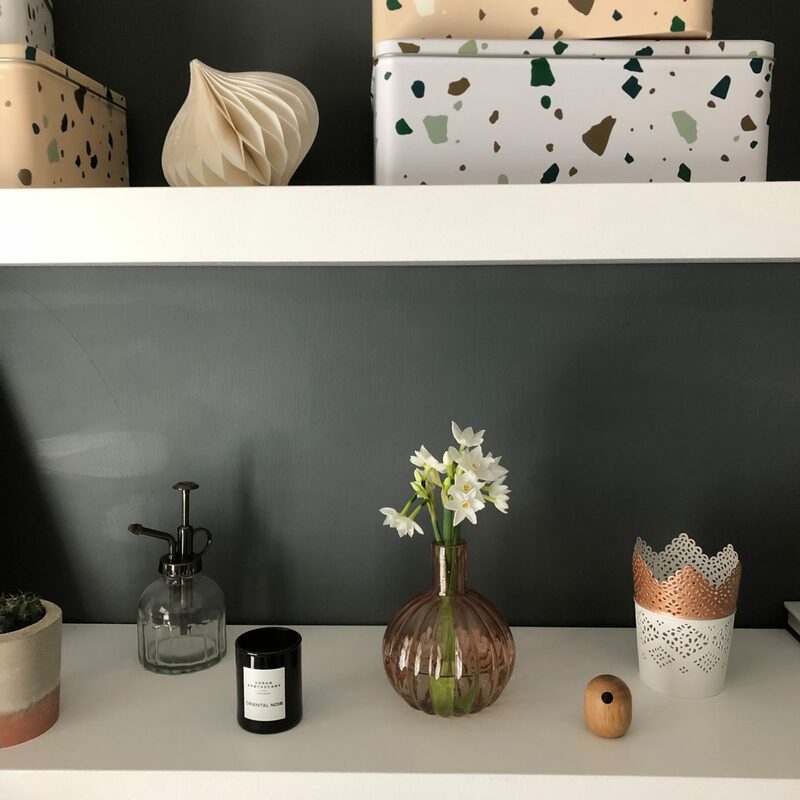 I keep it on the shelves or on my desk with just a couple of stems in it to perk up the space and it doesn’t feel cluttered or like it’s getting in the way. 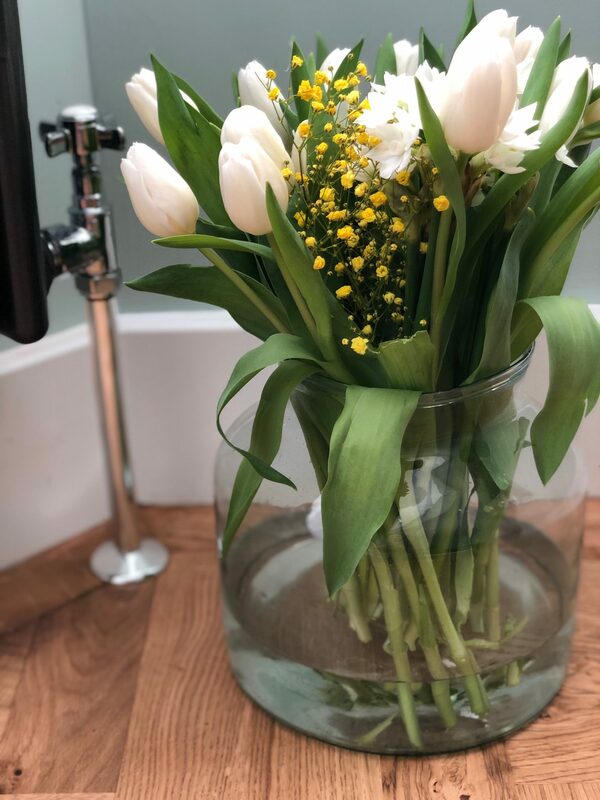 The bathroom is another overlooked space when it comes to fresh flowers. 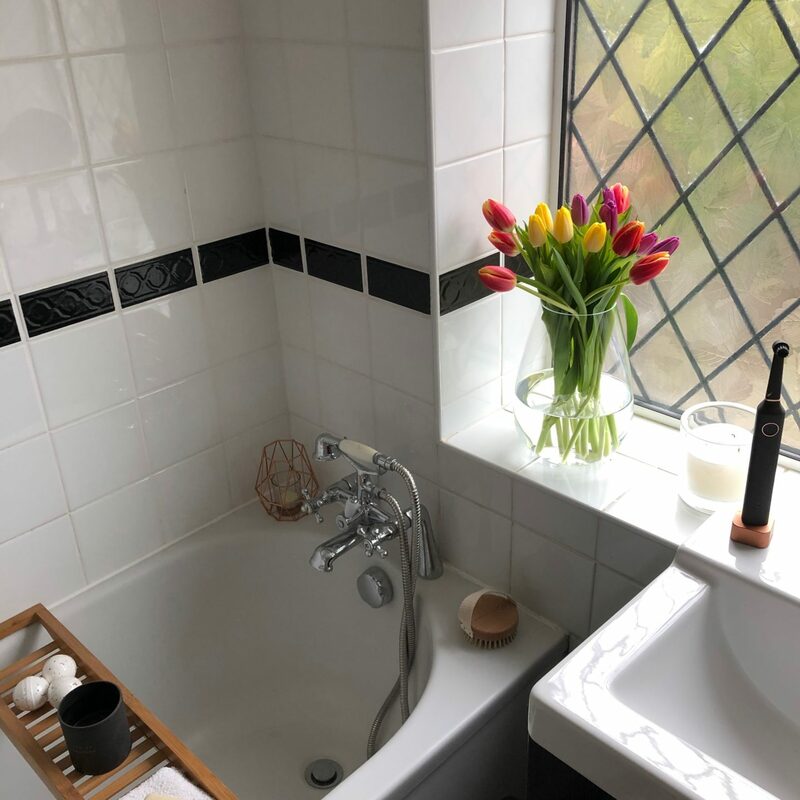 Our main bathroom has quite a minimal and very monochrome look, it’s a temporary makeover from the bathroom we inherited. 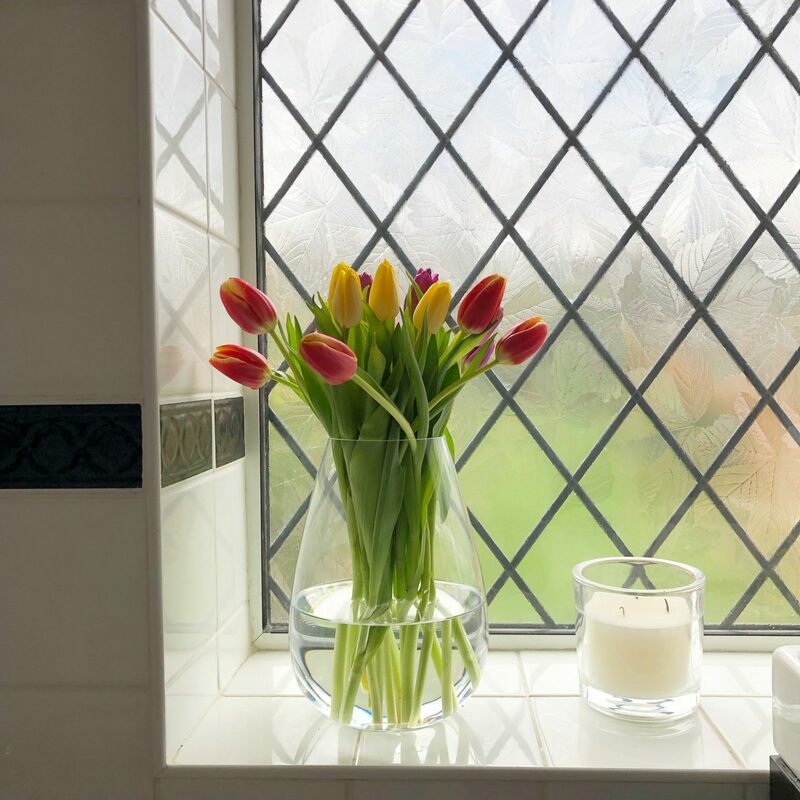 Whilst we’re saving up to renovate it, a vibrant bunch of colourful tulips on the windowsill adds a little bit of whimsy in this elegant teardrop vase. We’re a little bit limited for styling space in the living room at the moment since this is one of our main renovation focuses. We don’t have a coffee table and our newly built alcove cupboards and shelves are still painfully bare. But where there’s a will there’s a way. 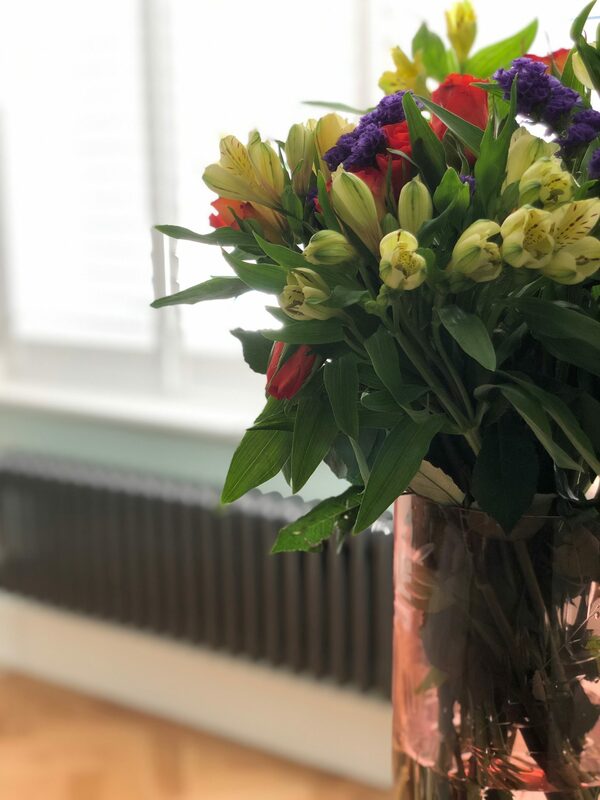 I’ve been using the ledge of our large bay window for this stunning etched cylinder vase when I can keep Boo off the windowsill, perfect for larger displays like this Fairtrade Rose and Alstroemeria bouquet. And never underestimate the unusual! 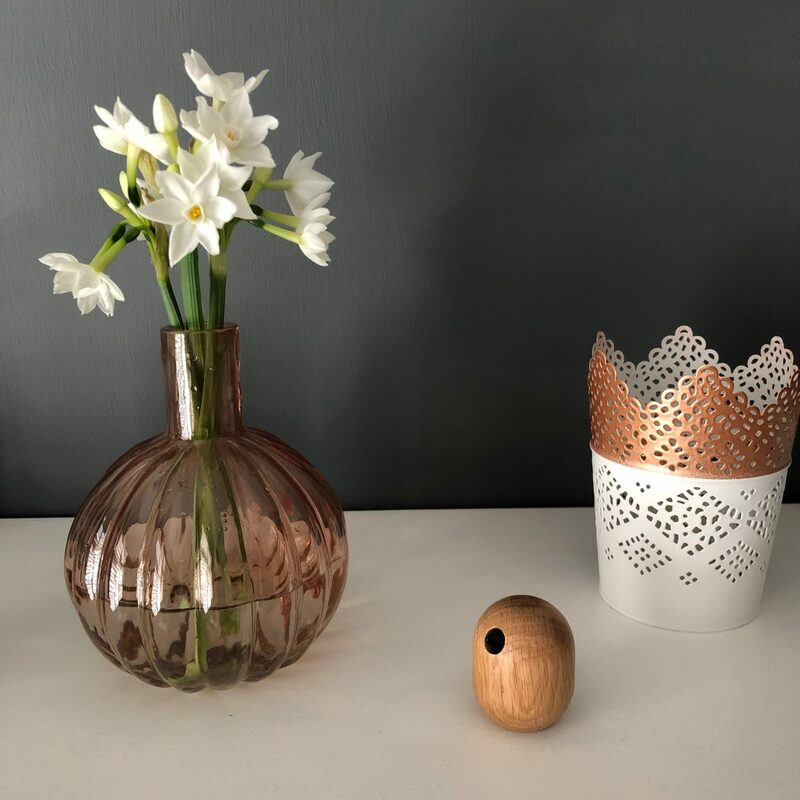 Despite having a boisterous dog and an inquisitive cat, they’re both fairly well behaved which means that I can get away with vases on the floor so long as they’re sturdy enough. 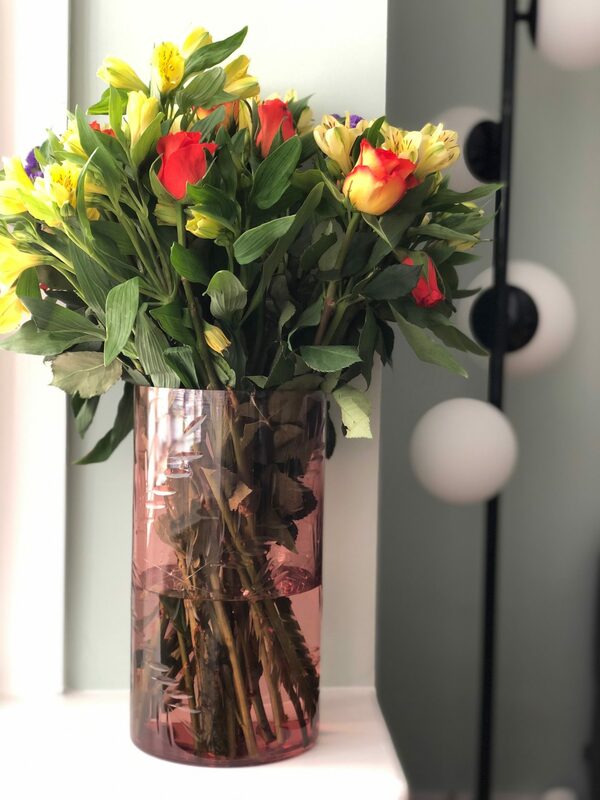 What I love about Marks and Spencer flowers over and above anything else is that they’ll always brighten someone’s day, whether for ourselves or a loved one. The versatile accompaniment to any home style, affordable and guaranteed to make us smile. AD // This is a paid partnership in collaboration with Marks and Spencer. All words, thoughts and images are my own. As always I would only work with brands or products that I genuinely love and would use anyway. My boyfriend actually bought me a bouquet of tulips the other day from M&S as a surprise mid-week, and I love them! 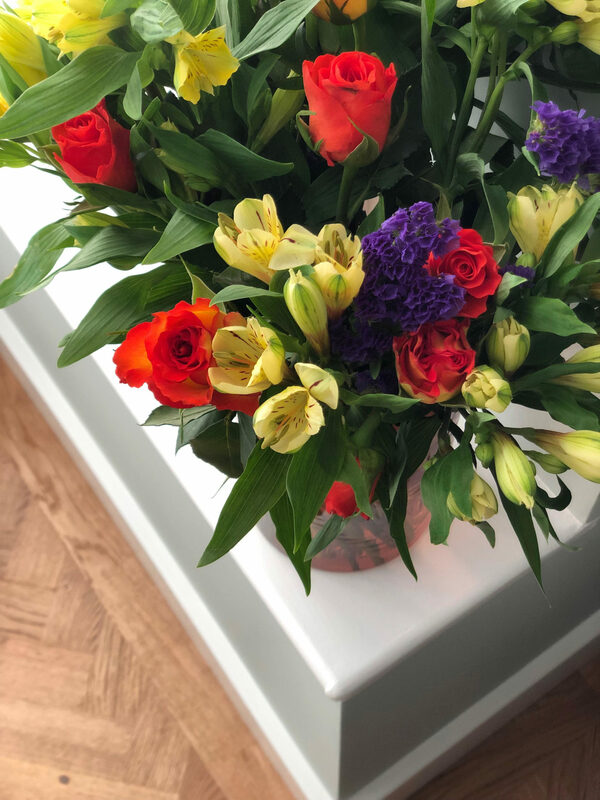 They are blooming beautifully and really add a cheerful, colourful focal point to my dining table! I think they’ve done a great job with their flowers! 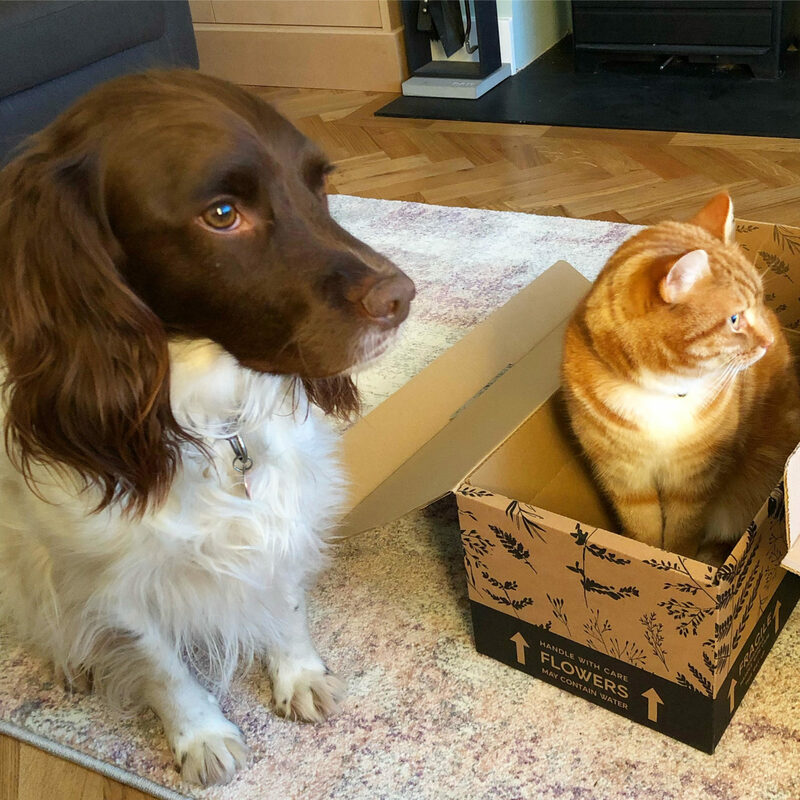 PS – I love the photo of your cat Boo in the box! Very sweet! 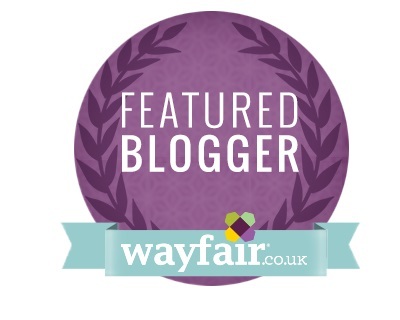 Beautiful bouquets and some great tips there for choosing for others too! I love how, even though we had the same options, we’ve picked something so completely different – both beautiful in their own way. Just shows they have something for everyone! Love that we get a peak of your flooring too. It’s gorgeous, not surprised you’re so chuffed with it. Absolutely beautiful! Nothing beats flowers and there is definitely a bit more class and style to M & S. I love your pink little vase! Great post and lovely photos. I don’t mind January either apart from the fact that my home is rammed with new toys I have nowhere to store. I do love M&S flowers though. They are always so fresh and such good quality. In fact I got all my wedding flowers from M&S and they lasted so long after our special day, our home was full of flowers and that was after we gave lots away. 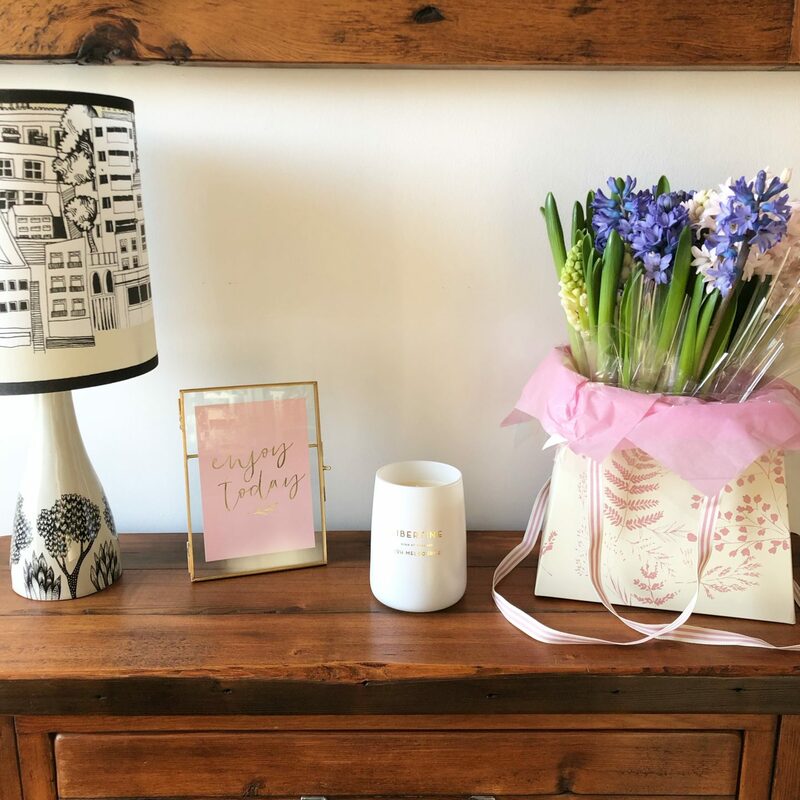 I purchased the scented spring bouquet and didn’t it smell amazing! The scent was so powerful i could smell in when I was in other rooms in the house!!! I buy flowers in M&S about every other week! 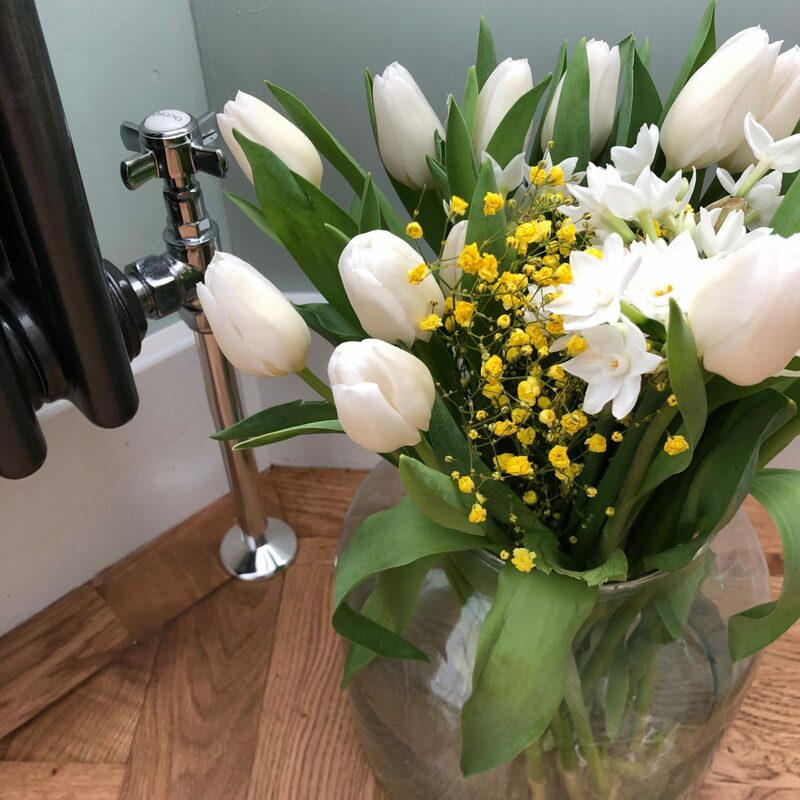 I actually picked up two bunches of tulips just yesterday, as I live less than 3 min walk to M&S it’s to do it on my way home. Lovely styling.